Foil packed. Great for roasting or mashing in their skins. 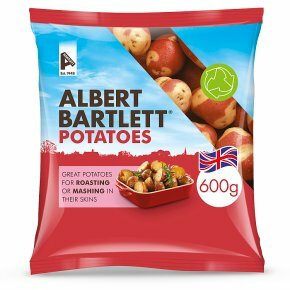 Be Inspired Our Apache potatoes may look a little different, but they are packed full of flavour. Try them roasted whole in their skins or as a luxurious mash. 1 Preheat the oven to 220°C / Fan 200°C / Gas mark 7.2 No need to peel - rinse and dry the potatoes.3 Cut larger potatoes in half.4 Put the potatoes in a bowl and add 3 Tbsps. of olive oil, season.5 Place on a baking tray and put in the oven for 30-35 mins, until golden.6 Turn halfway through cooking.Tip: Sprinkle with some fresh rosemary before roasting for a more aromatic taste!